Montreal, Nov. 14, 2017 — Research has already shown that women who develop either diabetes or high blood pressure during pregnancy are at risk of getting type 2 diabetes, high blood pressure or heart disease years later. Now, a new study from a team at the Research Institute of the McGill University Health Centre (RI-MUHC) and McGill University shows that the risk of developing those conditions post pregnancy is drastically higher if the women had both diabetes and high blood pressure during pregnancy. The study, published today in the American Journal of Epidemiology, doesn't end with the mother's risks. The father's risks also rise if the mother has one gestational condition and rises even higher if she has both. Drawing on medical records from 64,000 Quebec couples, the researchers set out to understand how each of the two gestational conditions separately affect women's health following pregnancy, but to also understand the risk the two present in tandem. 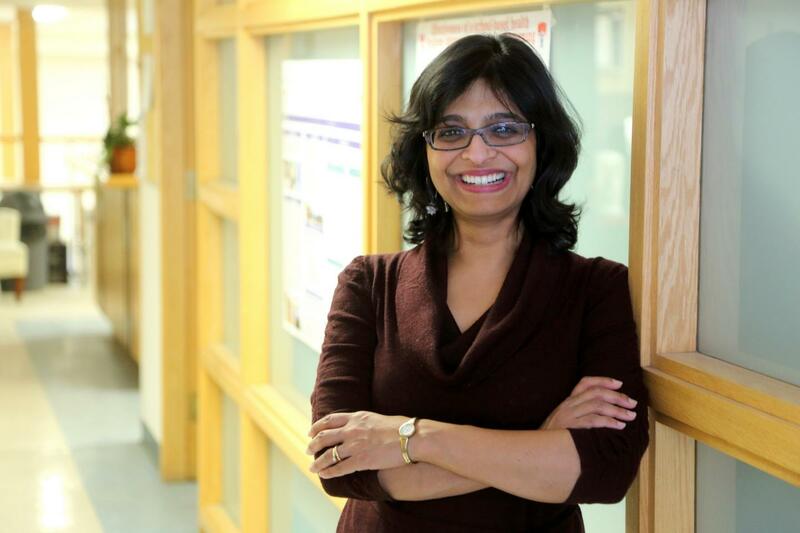 "Both of these factors are interrelated, so we decided to look at them together to create a combined indicator," says the study's senior author, Dr. Kaberi Dasgupta, clinician-scientist in the Metabolic Disorders and Complications Program at the RI-MUHC and an internist at the MUHC. Her group looked at three cohorts of women: those who developed neither blood pressure nor diabetes during pregnancy; those who developed one or the other; and those who were diagnosed with both. "When you look at them separately in mathematical models, you underestimate the effect," says Dr. Dasgupta, who is also an associate professor of Medicine at McGill University and the associate director of the Centre for Outcomes Research and Evaluation (CORE) at the RI-MUHC. "We didn't just say, 'You have diabetes. That's the end of the story. You have hypertension. That's the end of the story.' Instead, we asked what the added risk is of having both. That, I think, is the biggest take-home message." When looking at the numbers together, the researchers were struck by the results. "We found quite a dramatic combined effect," adds Dr. Dasgupta. "Having either of the conditions increased a woman's risk for diabetes in the future by 15 times. But if the woman had both of them it increased her risk of diabetes by 37 times." The risks of developing hypertension in the post-pregnancy years were also significant. While a diabetes or high blood pressure diagnosis during pregnancy doubled the risk of later developing high blood pressure, having had a diagnosis of the two made a mother six times more likely to develop hypertension in the future. "Knowing this will allow physicians to identify mothers at risk and to work with them to make lifestyle changes in an effort to help reduce those risks," says first study author, Dr. Romina Pace, internist and physician-scientist in training at the RI-MUHC. One of the more novel approaches to the study was its focus on following up with the fathers as well. Researchers set out to see if these pregnancy conditions had a predictive effect on the father's chances of developing them later in his life, since a live-in partner shares similar dietary and exercise habits, both important determinants of these conditions. "We found there were increased risks in the father as well. This shared risk is an important finding because it can help promote collaboration between partners to make lasting lifestyle changes in the household together," adds Dr. Pace. "Prevention of type 2 diabetes is a critical public health issue for Canadians," says Dr. Jan Hux, chief science officer, Diabetes Canada. "This important study not only confirms that this risk is elevated following an episode of gestational diabetes but quantifies its magnitude. A mom with a new baby may not feel she has the time or energy to devote to adopting a healthier lifestyle as an effective way to reduce this risk, however the fact that her partner shares the risk may be the impetus needed for healthy changes." Dr. Dasgupta and colleagues hope their findings will raise awareness about the potential long-term risks associated with gestational diabetes. "We should look beyond the pregnancy and start thinking of our household, the habits and routines, as a kind of womb that can have a significant influence on our families' well-being,'' says Dasgupta. This study was funded by the Diabetes Canada and the Lawson Foundation. Dr. Romina Pace holds a clinician scientist in training award and Dr. Kaberi Dasgupta a senior clinician scientist award, both from the Fonds de recherche du Québec-Santé (FRQS). For more information, read the study online.